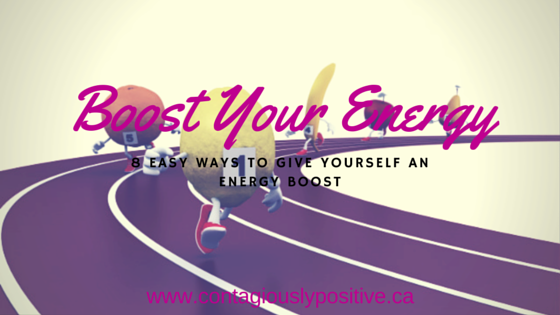 Do you feel like you are running on little to no energy? Do you crash at 2:00 pm, feeling like you could take an 8-hour nap? If you answered yes to any of these questions, you need energy boosters. I have just the solution for you. Just like you, I used to feel like morning came too soon and bedtime came too late. When I changed my lifestyle and started practicing daily healthy habits, everything changed. I’m not saying I never get tired, but I don’t get tired for no reason. Meaning, fatigued caused by what I ate, and how I moved, or rather how I didn’t move. There is usually an explanation for your fatigue and it isn’t always caused by lack of sleep. Here are 8 small changes you can add to your day. Choose them all, or choose one at a time. Every small change can make a huge impact. 1. Start your day by drinking a large glass of water with fresh lemon juice. A couple tablespoons is all you need. This will wake up our metabolism and give your brain the wake up call it needs to start the day. 3. Have a healthy breakfast. I know, I know, you never eat breakfast. I get it, I used to say the same thing. If you have a difficult time swallowing the idea of breakfast, keep it simple and drink it. A smoothie is the best way to start your day. If you skip breakfast, your metabolism will be slow throughout the entire day, causing you to feel sluggish. It’s also good for losing and maintaining your weight. For those who like a heartier breakfast, here are two of my favorite healthy breakfast recipes to help you get started. 4. Have a balanced, healthy lunch. Skip the fast food that makes you feel like you need a nap after you eat it. A hearty salad with a light soup, or even leftovers from last nights meal. If you want to learn more about creating balanced lunches, there is an entire module in my Contagiously Positive Healthy Living Program. 5. Drink lots and lots of water – at least 8 glasses a day. Water is life. You cannot survive without it. Fatigue often stems from being dehydrated. Coffee, pop and fruit juices do not count. These have the opposite affect and dehydrate us. If you think water is too boring, add some fresh fruit. Buy a large water bottle, add your favourite fruit and fill it up. It will last all day as you refill it. 6. Limit your coffee intake to 2 per day – 1 in the morning, and one around noon. Coffee gives you a caffeine boost, but it is short lived. Too much coffee can cause us to have restless sleeps, making us feel tired the next day. Try not to have coffee after 2:00 pm. 7. If you crash at 2:00 pm, don’t grab the coffee, as mentioned above. Instead, eat a green apple and drink a cup of green tea. Both are natural energy boosters. A green apple will actually give you more energy than a cup of coffee. Don’t believe me? Try it for yourself. If you know what time your crash usually occurs, have your apple/tea 20-minutes before crash time. It is so much easier to maintain your energy than it is to get it back. 8. If you sit at a desk throughout the day, get up and move. Every 60 to 90 minutes, get up, stretch and take deep breaths. Do this for about 2 minutes. Not only do we sit for too many hours, but we also don’t breathe properly throughout the day. Do you ever notice how much you hold your breath? Breathing in deep gives your brain oxygen, which in turns keeps you energized. Even by adding just a couple of these into your daily routine, you will be stacking the odds against energy drain. You are pretty awesome thought, so I dare you to do all 8. I double dog dare you! Still feel like you need more help? Are you sick and tired of feeling tired? Join our Contagiously Positive Healthy Living Program.